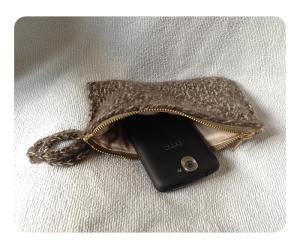 I know making a clutch handbag is not something I usually do, but I want to give Mom a present. 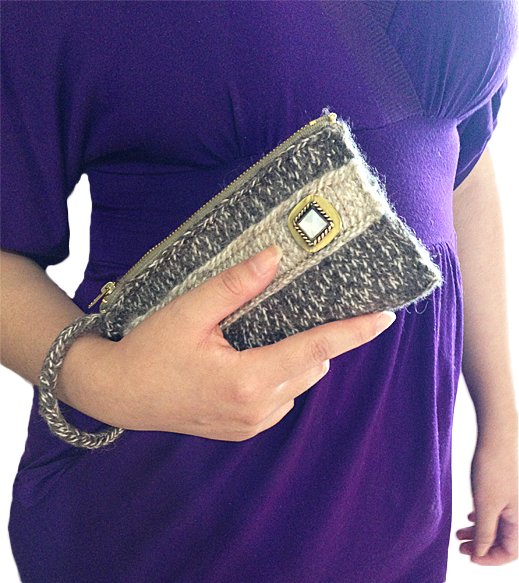 This purse is very easy to make as it uses basic knitting techniques (knit & purl). 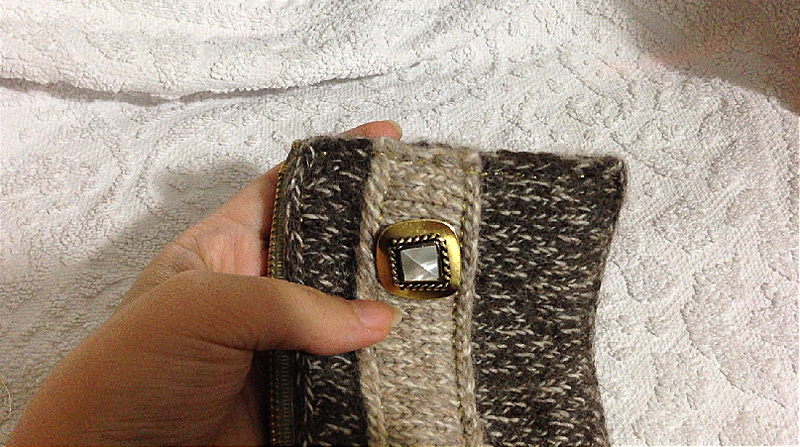 I actually find I spent most of my time sewing the parts together at the end. It’s quite a long process when making up, I didn’t expect it to be honest, but I am so happy that it’s all done! 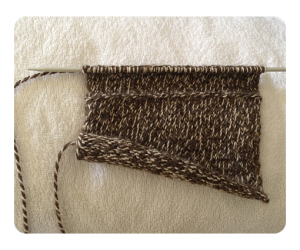 Keep going with Knitting on odd rows and Purling in even rows in similar fashion until Row 32. 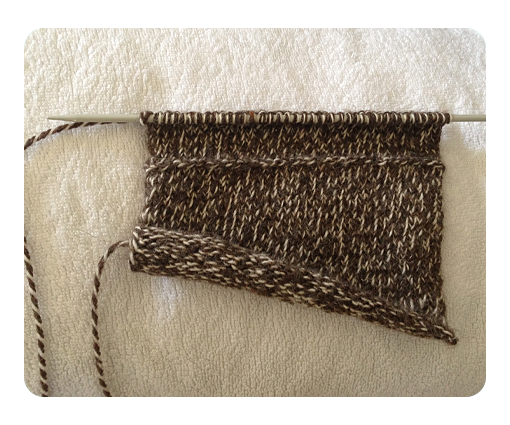 Knitting progression at Row 43, this is the right side. 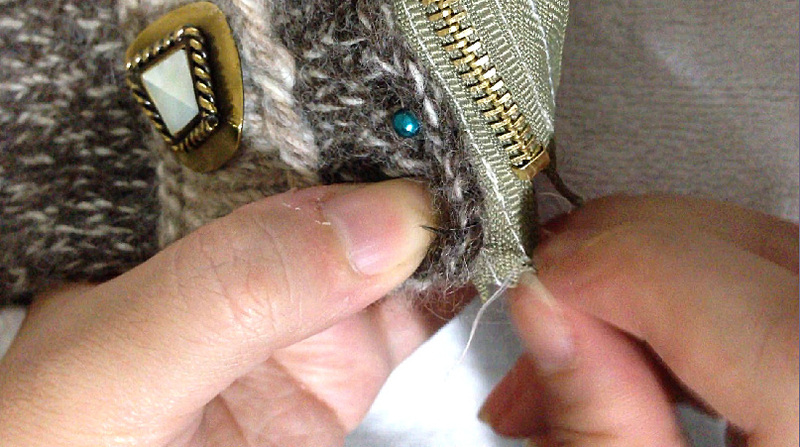 You can see before blocking, the materials curls up. 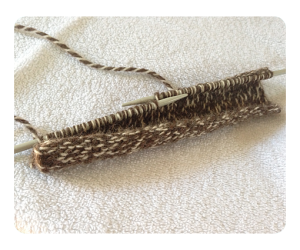 Cut yarn, leave approx 1 meter tail for knitting i-Cord later on. 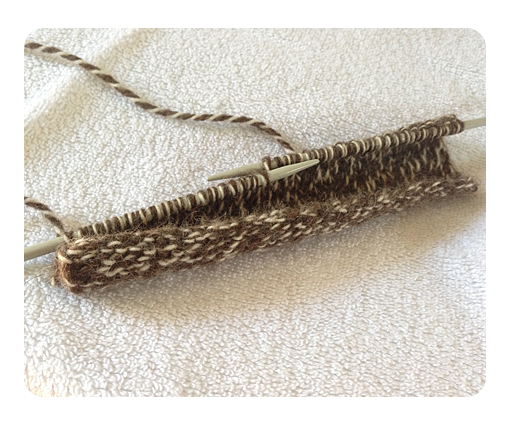 With straight needles and Light Brown, CO 42 sts. 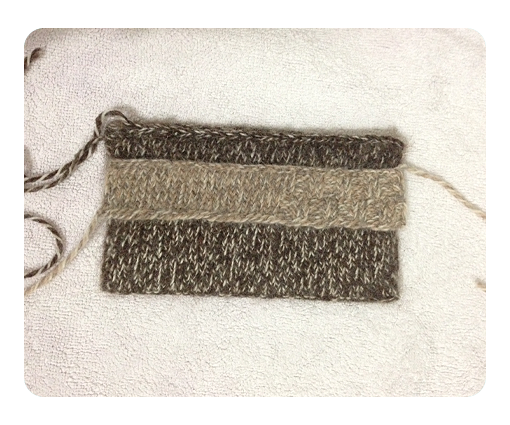 Once dry, weave the top decoration leftover yarn. 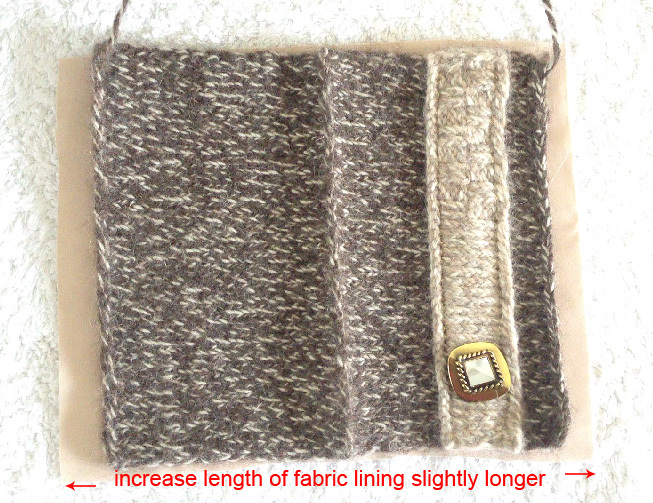 Cut lining fabric, match the width to the main body, but add 1.2cm to the length to allow for the zipper. 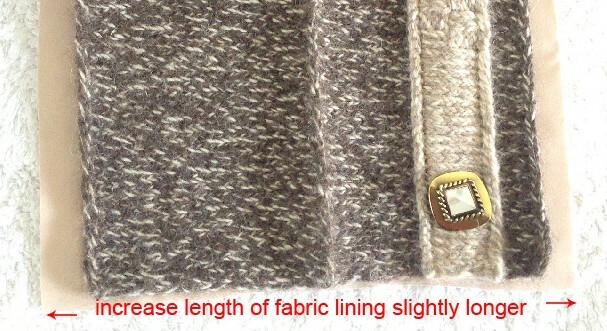 Cut fabric lining, increase the length slightly to allow for zipper. 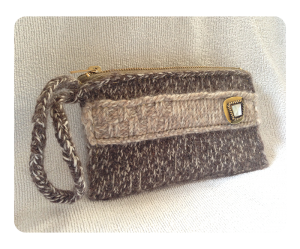 Knit i-Cord, then make a loop to the side of the bag, secure. Note: For all regular thread, I use 2 strands. For all metallic thread I use 4 strands. (DPN) double pointed needles, easy knitting patterns, free knitting patterns, knitted bag, straight needles, very easy knitting patterns. Bookmark. page (all the ads) don’t print out? The only way I know is to copy all the text on this page to a Wordpad / Microsoft word document and there you just delete the 3 ads on the page. (When you select you will not get the right side bars so you only have 3 ads to delete). I hope this helps.. I just learnt something new today. I discover how to print the page without all the ads. Under the “Sharing is Caring” section (it’s located on the bottom of the page, right above the comments section). There is this print icon on the far right (It’s called: Print with PrintFriendly). Hope this helps & Have a Wonderful Christmas! Wonderful details in your pattern writing. These will also be great for putting inside a larger bag. Should you just need a few things you can have a handy way to grab and go. 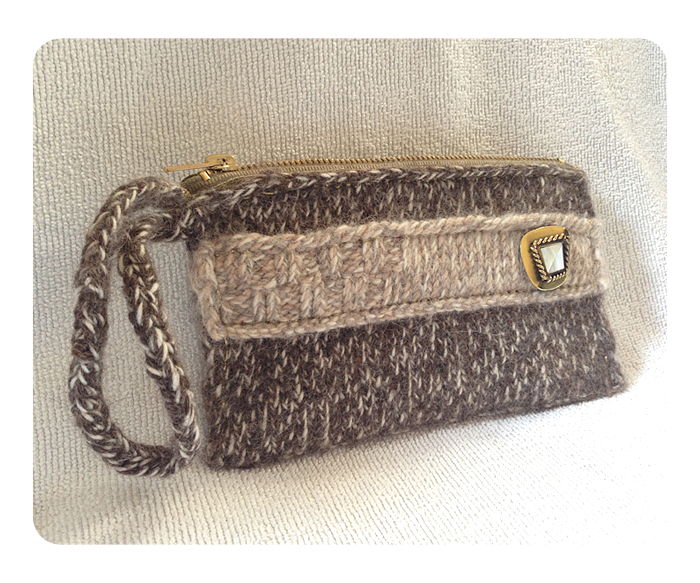 Thank you, Deb for your comments 🙂 Nice idea with putting it inside a bigger bag to have it as a smaller wallet! Thank you so much for these detailed instructions, i have just the colours i want to make one in..